Whenever i open up the goddamn launch.bat and i press a key it goes auto closes the menu....O god why? I'm assuming these instructions still work for Tekkit 3? Um.... i didn't have that path file you had... WHAT DO I DO!!!! If anyone read what I had here before, forget it. I fixed it. - mod_TubeStuff reports the BC Transport & BC Factory "doesn't seem to be installed"
Then...you didn't do it correctly. You're trying to allocate too much memory to Java for the server. Did you completely miss the useful links thread in General Tekkit, wherein you will find this thread? How much memory does your system have? Also, next time start a new thread for problems like this...we're cluttering up a nice guide thread. Thats because when the forums changed over all the links changed. Upon starting batch file I receive a text wall. Yay. 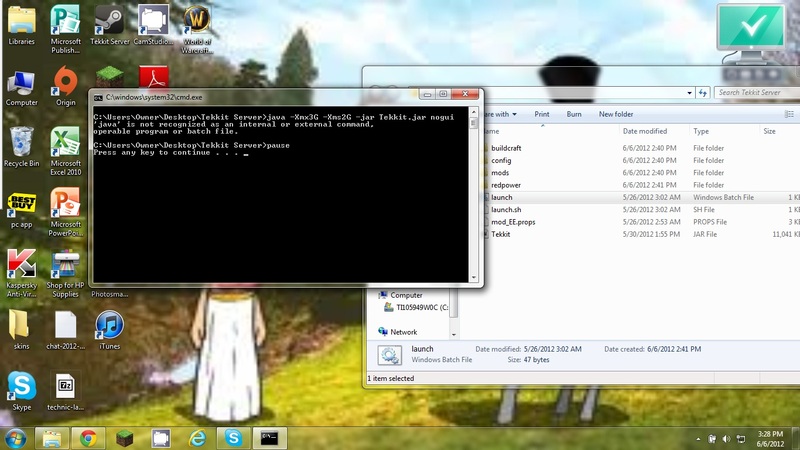 I am on a Windows XP (ya I know its really old), does this make a difference? I got the same error as "captainredcup" and "countlagular" does anybody know how to fix it? I tried hosting a server, everything worked until me and my friend tried joining, no matter what version we used, it always said we didn't have the right mods, we tried Tekkit 3.0.3, 3.0.5 and 3.1.0, none of them would work with the 3.0.4 server, could anyone help please?